In Valencia, Spain it is the beginning of the Spring Fiesta and Chief Inspector Max Cámara is unhappy. At the last minute he has been forced to stand in for his boss as the honorary master of ceremonies for the day’s bullfight. Cámara despises bullfighting. But he performs the duty with competence if not enjoyment and is relaxing in a nearby bar afterwards when word reaches him that Jorge Blanco, the matador who had so masterfully beaten the bull in the day’s fight, has been found dead. In charge of the investigation Cámara struggles with his own personal demons, office and city politics and a plethora of potential suspects in his quest to solve the case. Blanco was famous and much-loved, almost single-handedly responsible for reviving the city’s interest in bullfighting. Is that why he was killed? There are local elections due in which one party has made the banning of bullfighting its top priority which could have prompted someone to want Blanco out of the way. But the fighter’s personal life is also ripe ground for suspects as there are rumours about his sexuality which seem at odds with his engagement to a much-loved entertainer. Surprisingly, to me, the thing I enjoyed most about this book was its richly depicted setting which included more information about bullfighting than I could ever have anticipated being intrigued by. Which is why it is sometimes good to read things you think you might not like. Webster, who is not a native Spaniard but has lived there for twenty years and has published several highly acclaimed travel books about the country, really does bring the city alive for the reader with quite lyrical descriptions of the city, the festival, the food and the bullfighting. Early on Cámara meets a female journalist who is so much an acknowledged expert about the sport that she was the only reporter who had ever interviewed Jorge Blanco. She and Cámara debate the merits, or lack thereof, of the sport and she fills him in on any history and symbolism that might be relevant to his investigation and it is these exchanges that allow readers to absorb information about a subject most of them probably know little about. I really liked the way this was done, especially they way it enabled Webster to present both sides of the debate without being judgemental. The rest of the book was not quite as successful for me. I was not as taken by the character of Max Cámara as other reviewers seem to have been which of course is a highly personal thing. Perhaps I have had my fill of alcoholic detectives who argue with their superiors and are, in the end, fairly self-absorbed (in this instance Cámara’s inner life revolves around his worries over his fertility which I literally could not have cared less about). Ultimately I didn’t find him quite engaging enough to care that much whether he survived the ever-looming threat of dismissal but I can’t say he was a badly drawn character, merely one that did not appeal very much to me. I found the female characters who included Blanco’s fiancée Carmen, the journalist and Cámara’s girlfriend a little flat and forgettable though I can’t really put my finger on a reason for this. As a mystery the novel mostly worked although the ending was a bit too contrived for my liking but that is a fairly common experience for me. I think writing believable but engaging endings must be very very hard. However the investigation itself was suspenseful and kept me guessing in just the right way. 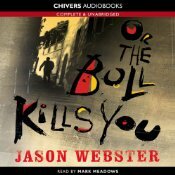 OR THE BULL KILLS YOU provided a real sense of being transported to the streets of Valencia, something I suspect was the result of the mixture of Webster’s writing and an excellent narration of the audio book by Mark Meadows whose Spanish pronunciation sounded wonderful in my ears. I think most people would like the book and some will love it, perhaps especially those who have not read quite as much crime fiction as I seem to have done (the people who all recommended it to me are occasional readers of the genre rather than die hard fans). Book Series #1 in a new series? This entry was posted in book review, Jason Webster, Spain. Bookmark the permalink. Great review, Bernadette, but I could not get on with this book. Nothing wrong with it, but the bullfighting bits/topic is a huge turn-off for me. Even though the main character was opposed, he still has to sit in for his boss at the start and so we are treated to a description of the bullfight. Then I found the attitude to women off-putting – I am sure well and truthfully depicted but not something I wanted to read about. So I only skimmed the last two-thirds. Perhaps I should have stuck with it, but I can’t help filing it in my mind as yet another macho-ish outing. No blame to the author, as he’s no doubt writing honestly about a certain sector of society and its attitudes. I can understand why you did not stick with it Maxine as the opening was certainly bloody and there were other bits that lost my attention a bit…I liked hearing the two main characters debate the whole bullfighting ethos and I did find it interesting to learn the history of what I consider to be a barbaric pass time – I haven’t been convinced of the reverse but it is always good to know how things have come to be the way they are. And I do think it was a bit macho-ish which is probably why the female characters felt so flat to me. Bernadette – I know just what you mean about the value of occasionally reading a book you think you’ll dislike. I do love books with an authentic and strong sense of place and culture so on that score I would probably want to give this book a go. But I must admit that two points you make in your excellent review make me wonder. I’m a little tired myself of the alcoholic self-absorbed detective. They’ve got to be really, really well-written for me to care what happens to them. The other is the bullfighting itself. I’m one of those people who are really opposed to it (odd for someone like me who’s a cultural egalitarian in a lot of ways). I just don’t know that I’d want to read a lot about it. I may, though…or not. Thanks for this excellent review, Bernadette, and for reminding me that I’ve been meaning to get hold of this novel for a while. I’m prepared for a slightly uneven read on the basis of your review and the comments that have been left here, but am very drawn by the Spanish setting (would up sticks and move to Spain in a heartbeat if finances allowed!). I’ve also followed a bit of the bullfighting debate (interesting to see reactions in areas of Spain where it is now banned), and even though I’m against for reasons of cruelty, I can understand why losing it is such a wrench, given its long central position in a certain kind of traditional (and macho) Spanish national identity. So learning more about the cultural significance of bullfighting would interest me too. Interesting review Bernadette and I’ve not read much crime fiction set in Spain (I presume the writer is Australian). The bullfighting subject matter doesn’t put me off per se, it would depend how it was represented. Bullfighting? I saw a bullfight in Mexico City with some members of my family when I was 19. I was turned off but my other family members liked it. And since I’ve become so anti-cruelty to animals, I’m sure this would bother me to see it as a major piece of a book. Yet, I understand Mrs. P.’s comment above. I am glad that there are movements to end it though in countries where it goes on. Horse racing, too? After seeing a movie which portrayed pushing a horse to its absolute limit, with the prize and money the goal, with no regard for the animal’s health, I think I’m opposed to that. Nothing like seeing documentaries of horses racing, jumping and whinnying for the sheer joy of it out in meadows, free. Think I’ll skip this book but am always glad to read the reviews.